Cellmax Root booster is a powerful vegetable-based root stimulant for young plants. Root booster stimulates a rapid growth of the rooting system in the initial stage of the plant. And increases resistance of plants. It also improves vegatieve growth. Root booster is ideal for cuttings and plants that need to be repotted, or are unhealthy. Result: Improves resistance and ensures a strong root system. Cellmax Rootbooster increases resistance and reduces the risk of diseases. When repotting (transplanting) and pruning, the plant’s resistance reduces significantly. 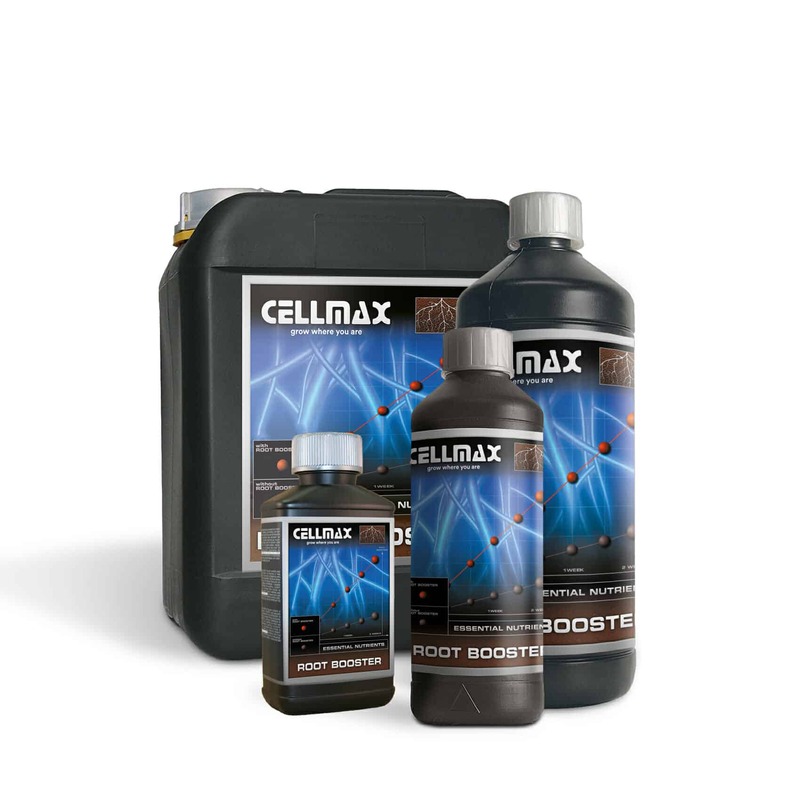 During these phases, Cellmax Rootbooster maintains the levels of resistance and protects the plant, so that growth can continue smoothly.Cellmax Rootbooster is rich in organic trace elements, vitamins, and has a vitalising effect on plants. Use Cellmax Rootbooster on young plants, in particular, when repotting. This allows the roots to continue developing properly and the plant to continue taking root.With Cellmax Rootbooster, plants stay healthy and strong. Cellmax Rootbooster can be used with other fertilizers. In the event that few roots develop, it can also be sprayed directly onto the plant. Ideal for potting young plants. Suitable for Fast growing Fruits & Vegatables –Suitable for cultivating on all kinds of Hydroponic setups like Deep Waterculture, NFT and aquaponics. Suitable for all kinds of Soils & Cocos substrates. Directions for use: Dilution ratio (1:250) i.e. 20 ml to 5 liter of water use with every time you give water on a daily base to the cultivation medium until a strong root system has developed. when repotting, you can pre-treat the growing medium with root booster solution. The results of root booster are better with low EC value, if necassary use during the first days only Rootbooster without other fertilizers. Storage: Shake well before using, keep dark and closed and frost free. Hi Cellmax. While visiting my local garden center, the owner recommended the root boost and organic grow. I decided to try something else instead of sticking with my usual brand. The results speak for themselves, My clones rooted faster and really blast out the roots, very impressive. Even hard to clone varietys that can 3 weeks are completely rooted through by week 2. The combo of using root boost first then following with half dose ( 25 ml per liter) of organic grow has produced some of the most vigour healthy plants I Have ever grown. ( been growing for 20 years plus) I cannot wait to try the organic flower. Impressed, Shawn. This stuff has given me the craziest root growth I’ve seen in over ten years of growing! The growth rates I see in my seedlings is simply mind blowing! They say big roots equate to big fruits and man is that the truth! This stuff will have you’re plants bursting out of their pots in no time at all! Personal tip……. I soak my seeds In a weak solution of rootbooster during the germination period for that extra boost! Works absolute wonders!